Corporate security teams and others responsible for protecting the organization from cyber attack have the enormous task of implementing and managing multiple security solutions – sometimes numbering in the dozens. This is far from easy and today, many cyber security professionals realize the need for a holistic approach to security using a platform covering all possible attack vectors. 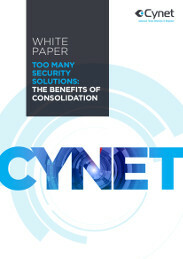 Download the Cynet whitepaper, “The Benefits of Consolidation - Holistic Security,” to learn more.